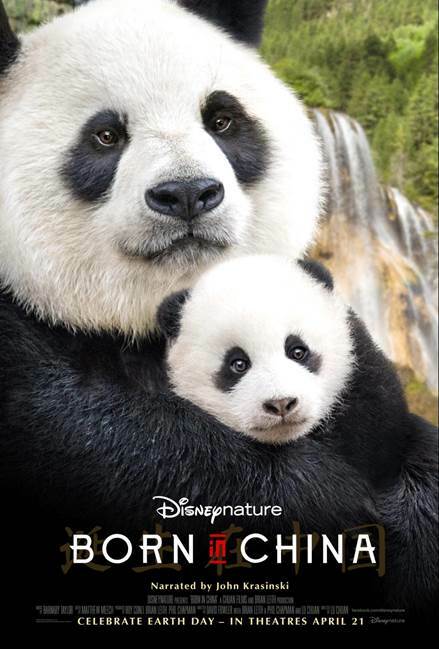 Director Lu Chuan and a crew of filmmakers venture into the wilderness of China to follow the lives of snow leopards, pandas, chiru, and snub-nose monkeys in BORN IN CHINA, the latest in the line of reliably Disney nature documentaries. The photography is gorgeous, capturing not just the beauty and grandeur of the film's animal stars, but of their habitat, as well. John Krasinski's narration helps shape the various narratives and anthropomorphize the animal stars. Given that the pandas grace the poster for the film, I was a bit surprised they didn't get much screentime. I guess since they have no natural predators and spend their days eating bamboo and rolling around on the ground, there wasn't a lot of drama in their lives. The monkeys and snow leopards, by comparison, experience quite a bit more danger and conflict, earning equal co-star billing. The chiru just sort of hang around the periphery of these stories, doing their grass-eating herd animal thing. In true Disney nature doc fashion, there are plenty of lighthearted moments of the animals being cute and silly. But the studio that killed Bambi's mother isn't afraid to show nature red in tooth and claw, either, and not all the furry creatures in BORN IN CHINA make it to the end. That's nature, after all, but if you or any kids you might consider taking to see this are on the sensitive side, consider yourself warned. There may be tears. 3 out of 4 stars.